History: When Absinthe became prohibited in France in 1915, this new law also prohibited spirits, similar to Absinthe. So basically all Anise based spirits were wiped off the market. Interesting enough that only 5 years after the ban, the secretary of finance decided to slightly lift the ban again an reallow Anise based spirits. However these must not contain more than 30% ABV plus they had to contain at least 300gr of Sugar per Litre. Today this would be regarded as a Creme! They also had an eye on color: These products may be green, but never „Feuille mort“ – resembling on Absinthe... In 1922 they raised the maximum Alcohol level to 40% ABV, in 1938 to 45% ABV. Due to the war they reduced it again to 40% ABV in 1941, to cancell this decission in 1951. This regulation is still valid today. Anise based spirits must not contain more than 45% ABV. Source: The Guy distillery has been found in 1890 to mainly produce Absinthe. So it’s been quite a shock for them when their main product became illegal. They were searching for new income sources and started other regionally fueld products – like Sapin. 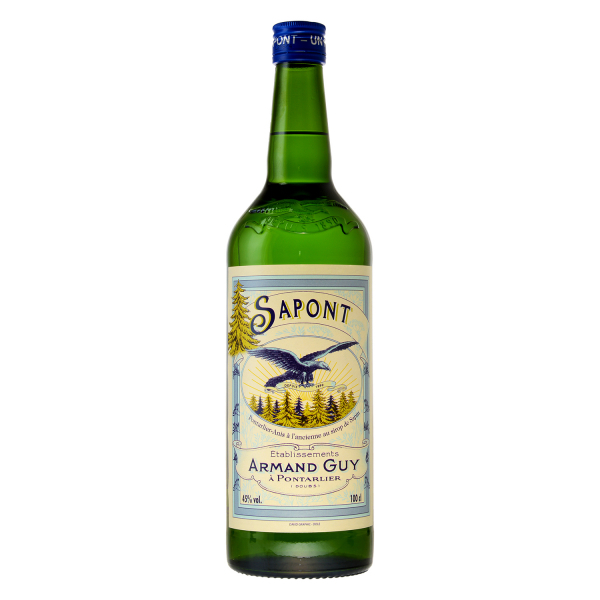 One can imagine that Armand and George Guy were happy getting back on Absinthe traces when they were allowed producing Anise based spirits in the early 1920ties. This product was basically the same as their Absinthe, however without the main ingredient for Absinthe – wormwood. This hasn’t changed till today. Only finest green Anise and a couple of other botanicals are macerated in alcohol and then distilled. Aroma: In the beginning Guy specifically mentioned not using any star anise in advertisements and one can still taste this in the products today. Star anise is pretty pungent and dominant, whereas green anise is delicate and leaves enough space for other herbal aromas. It makes a very nice, refreshing drink, without numbing your mouth. Pontarlier Anis - Ponsec: This variation contains a little bit of sugar what makes Ponsec very harmonic, round and long lasting. Sapont: Sapont is a delicious mix of Pontarlier Anis - a l'Ancienne and a Sirop de Sapin (pine buds) that Francois Guy created end of 2013 to honour his ancestors and the Haut Doubs region. Both flavours get together really well and make a very pleasant drink. Related links to "Pontarlier Anis Sapont"
Customer evaluation for "Pontarlier Anis Sapont"